FERRARIO - [No title]. [Two locals of the island of Ubi ]. FERRARIO, G. - [No title]. [Two locals of the island of Ubi ]. [No title]. [Two locals of the island of Ubi ]. - FERRARIO, G.
Title : [No title]. [Two locals of the island of Ubi ].. 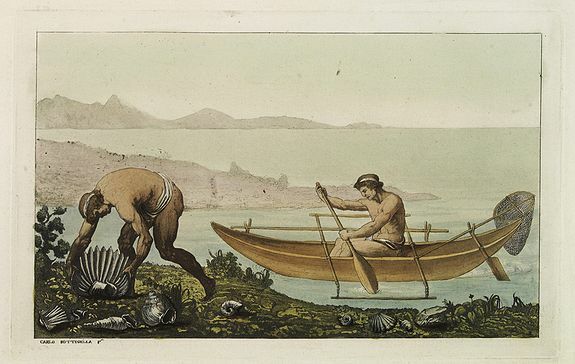 Description :Aquatint depicting two locals, one rowing to shore, the other searching for sea shells on the Island of Ubi in the Moluccas. Engraved by Carlo Bottigella.